The editors of this useful text on social work in an international context have brought together not only informative descriptive material from a number of countries and social work specialisms but also insightful analysis and reflections. These illustrate both the differences and the similarities in the practices and concepts of social work. The book makes a valuable contribution to the growing literature on local practice in a global environment. This is a book not afraid to plunge into the dangerously overwhelming depth and breadth of the global agenda for social work. Its editors are right to have confidence in the empowering impact of their international compendium – the exhilaration of the boldly global sweep of some chapters alongside the fascination of the intricate national detailing of others. Every chapter reinforces that social work’s historic failings, its contemporary challenges and its future possibilities have to be understood in a global context. This is a rich addition to the library of a self-reflexive global social work. 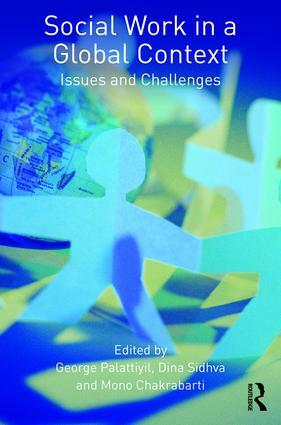 Social Work in a Global Context: Issues and Challenges offers diverse perspectives on social work in a globalized context. Chapters span countries where social work has recently emerged and those with a long-established professional tradition, adding to the richness of the discussion. These carefully chosen examples demonstrate the central premise of the volume—that social work is both a global profession and one that is heavily influenced by local context. Readers will gain a sophisticated understanding of the complex impacts of global forces on social work. The volume is a most welcome addition to the professional literature. Lynne M. Healy, Ph.D., Board of Trustees Distinguished Professor, University of Connecticut School of Social Work, West Hartford, Connecticut, U.S.A.
Dina Sidhva, PhDis an Honorary Fellow at the Edinburgh India Institute at the University of Edinburgh and a freelance researcher. She qualified as a social worker in India and obtained a PhD in social work from the University of Edinburgh. She has taught and practiced social work both in India and in Scotland. Her research interests span HIV/AIDS, women and children, asylum seekers and refugees, migration and human rights issues, commercial surrogacy, and focus on giving voice to the voiceless.